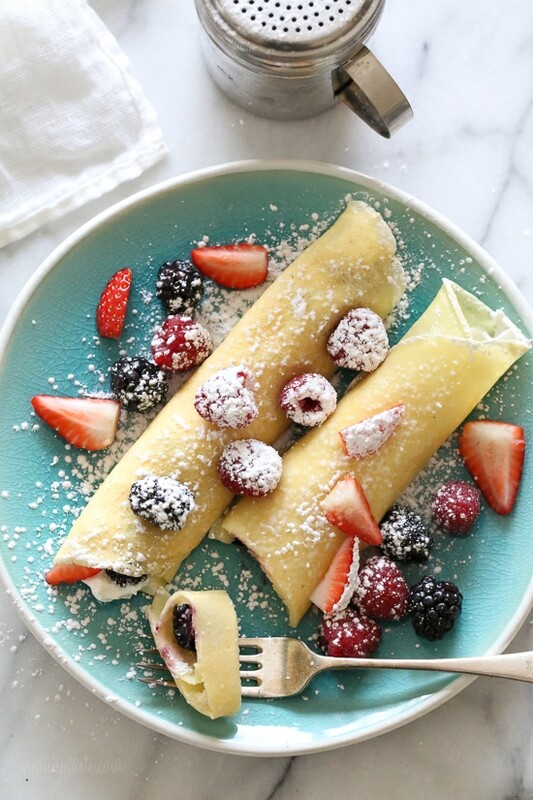 These blender crepes are so easy to make, and are perfect to serve for breakfast or dessert. They can be filled with fruit, jam, yogurt, ice cream, you name it! My father is from Prague and always made these delicious crepes, also known as Palacinky for us growing up and taught me how to make them at a very young age. I was probably about 8 or 9, I used to make them every night for my parents as a dessert. It’s funny how life is, now as an adult I find myself making them every week for my daughter Madison. It’s her favorite breakfast and she begs me to make them for her. 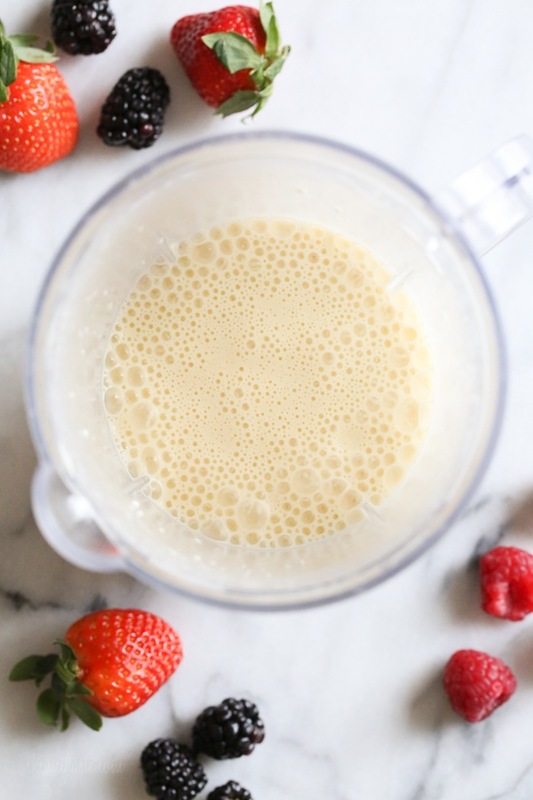 I whip up a batch in my blender on the weekends (it only takes a few minutes!) make her a few for breakfast and keep the batter refrigerated to make her two fresh each morning. You can also make them all ahead, cover with plastic and heat them up as needed. Whenever she eats them, she tells me how much she loves me – what more can you ask for. Since my father’s passing last week, the only thing that brings me some comfort is cooking the meals he used to make. 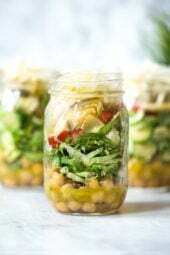 This recipe was posted way back in 2008 when I first started blogging and desperately needed new photos, which I finally came around to doing yesterday. While making them I could recall the countless nights cooking this with my Dad, memories I will cherish for a lifetime. His last few months here, he didn’t have much of an appetite, but he never lost his appetite for crepes which my Mom would make him every morning. 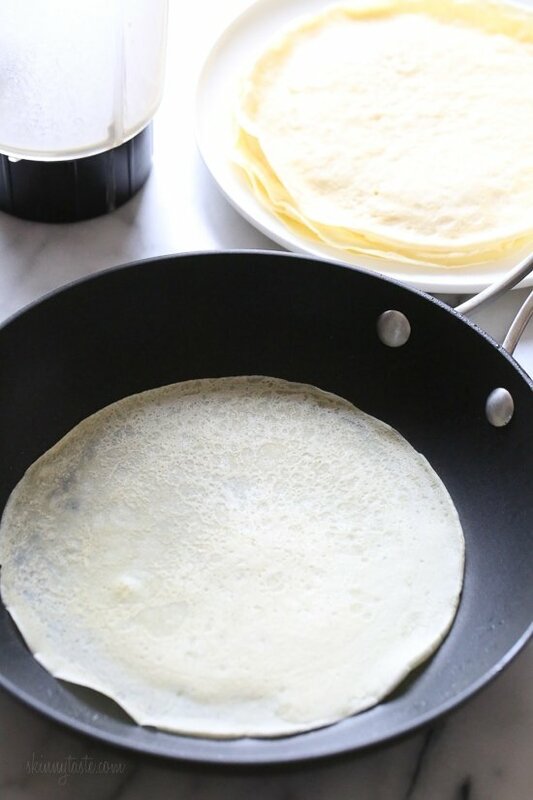 If you’re new to making crepes, don’t be scared, with the right skillet you’ll get the hang of it! They aren’t hard to make, if you can make pancakes, you can make crepes, it just takes a little practice – adding the right amount of batter, swirling it around and carefully flipping. After you make the first one, you’ll be a pro! For an added nutritional benefit you can use white whole wheat flour in place of all purpose flour. The batter can be kept in a container for about 4 days. I always make a batch on weekends, then make 2 each morning fresh for Madison which takes minutes to make. My dad typically used fruit preserves in his crepes, then rolled them and topped them with powdered sugar. Chocolate syrup can be drizzle over the top. Fruit butters such as apple butter and pumpkin butter make great fillings for crepes. Stewed apples or pears are delicious in crepes with cinnamon on top. Make them into a cake by layering the crepes and spreading the cream in between the layers. See my Crepe Cake Recipe here. Heat a nonstick crepe pan on medium-low flame. When hot, spray with cooking spray to coat bottom of skillet. 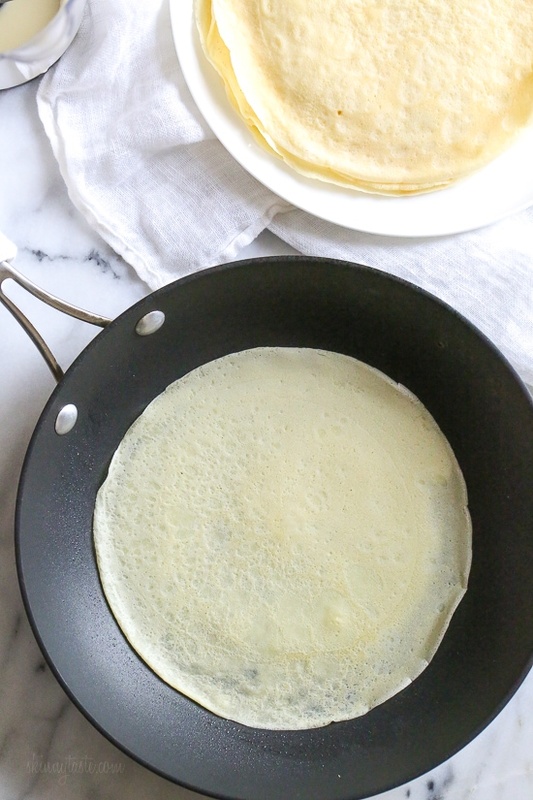 Pour 1/4 cup crepe mixture into pan, swirling pan slightly to make crepe thin and smooth. Cook for 1 minute or until bottom of crepe is light golden brown. Flip; cook 30 seconds to 1 minute or until light golden brown. Set aside on a plate and repeat with remaining crepe mixture. 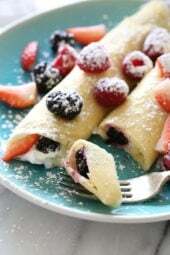 To serve, spoon 1 tablespoon cream or your desired filling into center of each crepe. 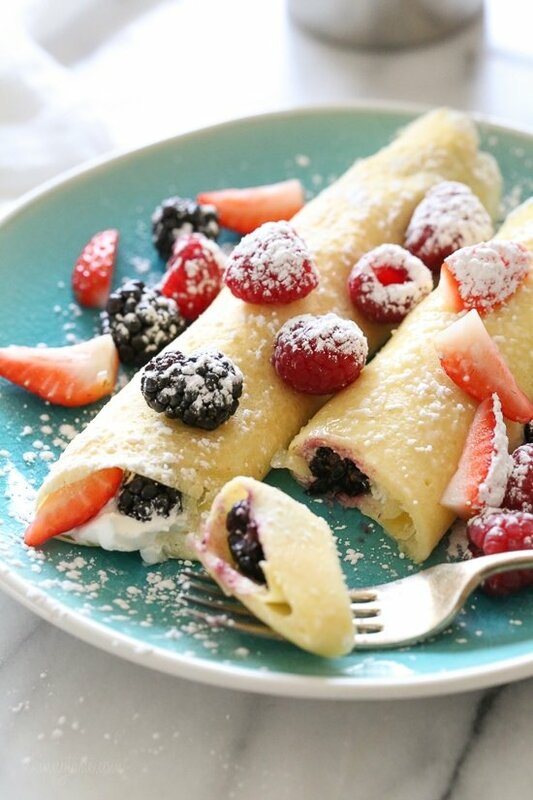 Top with some berries and roll crepes. Sprinkle lightly with powdered sugar and more berries on top. Best if served warm. Made these gf and with skim milk and they were AMAZING!!!!!!! Condolences to you and your family on the loss of your father. May his memory be for a blessing — his recipes, too! I am sorry for the loss of your father. Prayifor you and your family! I am thankful for you sharing all these recipes and the videos. I have never felt like I could cook. That has changed! I’m so sorry to read of your father’s death….I’m glad you have the memories and recipes to give you comfort. Cooking my mother’s recipes has done that for me, too. I will make these and think of you and him with thanks. Your recipe worked out great for me! Thanks for sharing it. I had been using a good recipe in the past, but it was one that required the batter to rest 30 mins. It’s nice to have a recipe version that doesn’t require the wait.By coincidence, my husband is a Czech citizen originally from Prague. Absolutely delicious !!!! Perfect for weight watcher needing something sweet , but healthy ! Being from Czechoslovakian parents, I ate these as a kid & loved them. Now, my Romanian husband makes them for our kids as a special weekend breakfast. My favorite filling is what my mother-in-law taught me: Riccotti cheese, a little bit of sugar, and Dill mixed together as a filling. Yum!! Recently, a little restaurant opened in town that serves just crepes!! I think they roll them up & serve them like an ice cream cone shape. Would cream cheese work instead of the whipped cream/cottage cheese/yogurt? It won’t come out the same. I bet ricotta would be tasty inside! Love all of your recipes. I made these this morning and they were delicious! The first one turned out a little weird but I got the hang of it once I started the second one, just like Gina said would happen! I filled mine with whipped vanilla yogurt and topped with powdered sugar, strawberries, and light whipped cream. I think the next time around I’m going to fill mine with a hershey’s chocolate paste like sauce and bananas! Can’t wait to experiment!For anyone who has an Instagram you can check out my page @wwgirl1022 and I have a picture of how they turned out on there! This recipe is awesome. I made it this way and I made a savory crepe with pesto, mozerella cheese, deli turkey and Roma tomatoes. It was SO good. Just added all those things after I flipped it once and I let the pan heat the last side while warming up the filling. And, I’ve been laboring under the pretense that crepes were hard to make….so not true! Thank you for this gem of a recipe! Made this recipe tonight and my 4 year old said it was the best food I’ve ever cooked! I will say, though, if using Gluten Free flour, I’d recommend at least 1/2 cup more milk. As written, they came out a bit thick with GF All Purpose Flour. I added a little more milk after each of the first two batches. Holy smokes. These crepes are the most amazing thing I have put into my mouth for a long time. They are perfection. I am going to try them savory next time to mix it up! These were so easy to make and delicious! My 3 yr old son helped me make them, and gobbled them up when they were done. We added cinnamon and nutmeg in the batter, then stuffed them with blueberries and cream we had on hand. Perfect! Thanks so much for a great recipe! You’re welcome! So glad your son enjoyed them too! I also have strong Czech heritage and pride. My Grandma Drahos used to make these all the time for breakfast. We called them “egg pancakes”. My Grandpa Drahos always kept bees an would drizzle them with butter and warm honey before rolling them up. My absolute favorite breakfast and I too make them for my children. My father also made fantastic Czech Kolaches, which were best the day they were made — warm and soft. My father passed away this past year and I know how hard it is. My best wishes for you and your family. Thank you for sharing this, that sounds wonderful. My condolences to you as well. I made these for some of my elderly neighbors to celebrate them for Mother’s Day weekend. I’ve never made crepes before but they were easier than pancakes! I did add about a teaspoon of vanilla to my batter, but otherwise followed your exact recipe-they were delicious! Filed with vanilla yogurt and my homemade strawberry jam, topped with powdered sugar and blueberries! Next time I’m going to try filling with Nutella and strawberries or bananas, or maybe peanut butter and jam! Thanks for a great recipe! Ahoj Gina! Zdravím že Slovenska a děkujem za recept, palacinky jsou zrovna tak oblíbené u nás! My husband loves your recipes, couple of them became our staples! I just know your dad is smiling as your share his recipe with us. Thank you both! do you have the calorie count for just the two crepes? These were so delicious and so easy. I hadn’t eaten them in many years and it reminded me of my childhood when my grandpa used to make them. Just what I needed. SO good!! Used some Vanilla yogurt inside and was delicious. Definitely making more often! Hello everyone! Just calculated this for Weight Watchers…..6 points for 2 NOT 4 points Freestyle. I was born in Slovakia (live in the united states now) and my mom made these all the time growing up! I really need to make these for my kids — thanks for posting the recipe! I made this recipe this morning. I was worried that the batter was too watery but it totally worked! Pretty easy! I’ll definitely be making these again. Do the points include the whipped cream? I see that an older comment says it includes zero point Cool Whip. Wondering if how it’s written now is still accurate, as both regular and light whipped cream would be 1 point. …and I forgot to say, I’m so sorry for your loss! Thank you for sharing your amazing culinary upbringing with all of us. Why can’t I login in and access all of the recipes that I had pinned? So sorry for your loss., and you are right, food gives comfort in a good way. For the last day or two I’ve been thinking of blini’s (similar to your crepes) which my Father used to make over 50 years ago. This morning I wake up to your recipe! Unbelievable. Reading the various posts I saw mentioned chicken paprikash. I would love to relive this recipe as well. My Mother used to make a green bean soup which she would make and I still remember to this day. I think it had sour cream and maybe some vinegar. It might be a Slovakian/Hungarian recipe. If you could bring this back to life, I would be forever grateful. I am so very sorry for your loss. What wonderful memories you have of your Dad and his cooking. May you find comfort, knowing that his memory lives on, as we all continue to cook his favorites! This looks delicious and thank you for sharing! your beautiful post.. Enjoyed everyone’s comments. Simply wonderful, easy, comfort food, loves the berries, cream and powdered sugar taste all together! Loved these! I used skim (that is what I had on hand) and added a little vanilla extract to the batter. So, so delicious! Topped it with the bananas sautéed in brown sugar and cinnamon! Thank you Gina! These were amazing!! 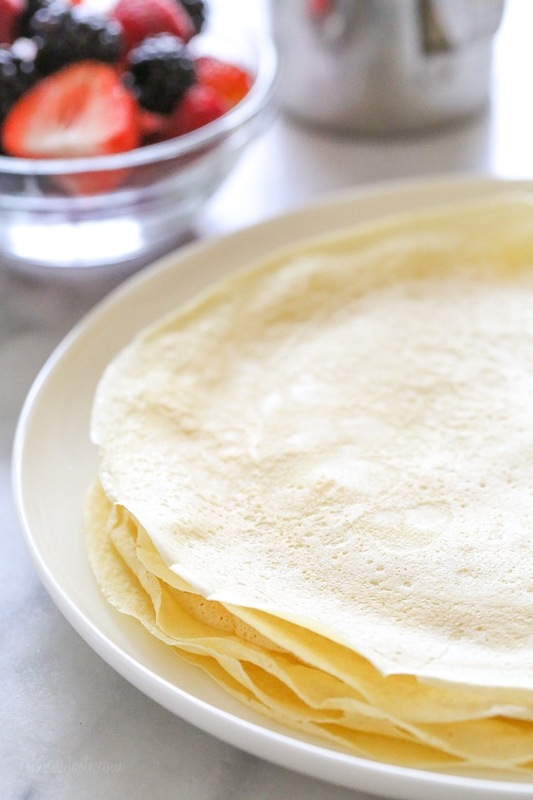 I’ve never made Crêpes before and this recipe was so easy. Thank you for sharing all this wonderful recipes. I really would like to try these, but I need to make it dairy free. Would almond milk work? Also, I will say that I feel closest to my mom, who I lost 3 years ago, when I make her recipes. Especially when my kids enjoy them. I am so sorry about your loss. I have connections to both my parents through recipes as well. Always a way to bring a piece of them back when I need it. Sending you and yours peace and prayers. Thanks for all your WONDERFUL recipes, too. My heartfelt sympathies for the loss of your father. Thank you very much for the recipe for palacinky (Slovenian spelling). I really appreciate some unique eastern European food. My mother used to make them for me when I was a child. Delicious. She would make them for breakfast, with jam in the middle, or plain, sliced into chicken noodle soup. Unfortunately, she is not a “measurer” when she cooks, so I can never get a recipe from her. Thank you again! 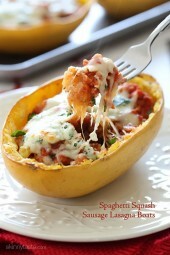 I will be making these very soon!!! Sorry that hear about your loss! My mon was from Prague as well and my gradnma would make these for me often, but having one will make me feel like a kid again. Thanks for the recipe and sharing your feelings with us. What are the WW FreeStyle points just for the crepes? This was my first time making crepes and they were so incredibly easy and delicious. I’m trying to lose weight and my husband is trying to lower his cholesterol without meds, and your recipes are so reliable and great for both of us – you’ve never steered me wrong. I love to cook and have a habit of not following or using recipes, but yours are the only ones that I will actually follow line-by-line. Thanks Gina. So sorry to hear of your dads passing. By sharing your wonderful memories you brought back a wonderful memory of my mother, who passed 27 years ago. She was born here, but her parents were from Austria in the Karpathian Mountains. My mom would make these for us as kids and when I had children she made them for my boys. I totally forgot about these. Thank you for bringing that wonderful memory back to me. She would fill hers with applesauce and on special occasions, Mott’s made a Raspberry Applesauce. OMG it was wonderful! I’m smiling as I am writing this. I’m going to see my boys (men) in a few weeks. I think I’ll surprise them with some “Roll Mops” for breakfast. That is what my mom called them. Hugs and Kisses to you and your family. So sorry to hear about your loss. Thank you for sharing one of your dad’s favourite recipes and one of your childhood memories with us. I’ve always been intimidated to try crepes but this will be the one that I try. Isn’t it just wonderful to carry on family memories through recipes and food that can be shared and experienced by each generation?! My mother was of Czech ancestry also and our “pancakes” were always these crepes that she buttered, sprinkled with cinnamon sugar; rolled and then drizzled with syrup (and believe it or not we always used Karo syrup!). We used to beg for these Sunday or holiday treats and each of my brothers and sister can remember our extreme disappointment the first time we ordered pancakes in a restaurant and were faced not with our beloved crepes but heavy pancakes with maple syrup. Thank you for reviving such loved memories of family and food love!! SO funny, as a kid I loved them with Karo syrup! And yes, my daughter is spoiled I guess because eating breakfast out is never a good experience. Just made a batch for breakfast this week. We did a test run with my son as the official taste tester, two enthusiastic thumbs up! Gina, I’m so sorry for your loss, will be praying for you. How blessed you are to have had two awesome parents to guide you through life, food being a small portion of your legacy. Thanks for sharing your gifts, may their memories be honored by many every time we break bread. Thank you Wendi, I cherish the memories. I’m so sorry about your dad Gina. He sounded like a beautiful person. It’s wonderful you are able to remember him through these recipes! I am going to Prague for a few days next month and I am very excited to eat at many Czech dishes as possible! Thank you for this recipe. I’ve been on WW for 5 weeks now, and have been craving pancakes but didn’t want to spend the points. 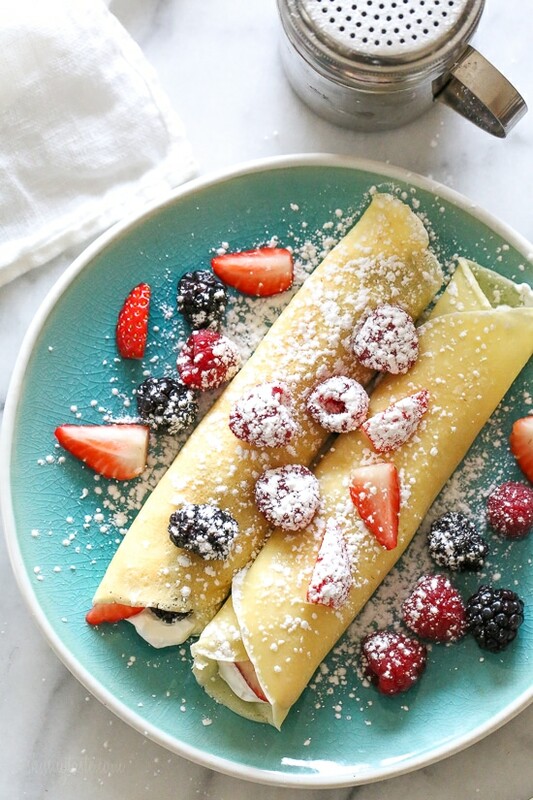 These crepes filled with strawberries, bananas and chocolate chips totally filled that craving without being too point heavy! They were so easy to make. Hope the happy memories with your dad help you get through this difficult time. My husband made crepes with Sara Moulton, on her cookbook tour and hasn’t made them for me yet… These look delicious! My deepest condolences Gina. I lost my mom 4 months ago and it is so painful. She was native born french and her dad was a chef. Traditionally my family would make crepes simply sprinkled with sugar for the Mardi Gras season which is quickly approaching us here in New Orleans. Thanks for jogging my memory- I made them for her last Mardi Gras and now that I am on WW I haven’t thought about making treats for myself. I am looking forward to preparing and eating these! Big Hugs! These were delicious!! I used nonfat Greek yogurt as my filling. I used almond milk & gluten free flour for the crepes. These were so tasty and not heavy!!! Thank you for sharing! That is just what I was reading to see, if almond milk would work!! I’m sorry to hear of your father passing. My dad’s family is from Bohemia, and my mom’s is from Czechoslovakia. I grew up in a community called the Bohemian Hills eating several Czech recipes. We grew up calling this recipe “Egg Pancakes” and ate them with butter and syrup. I love your SkinnyTaste version. Thank you! My Czech grandma also,made these delicious palacinkys and would refrigerate them in stacks. Loved them and thank you for the recipe. God bless you during this difficult time. Wonderful recipe, and one that I think I can tweak to make gluten free and reasonably safe for low FODMAP AND maybe use egg substitute for my egg allergy. I’m so sorry that you have had to endure your father’s passing, and grateful for the sweetness of the memory that you chose to share. My heart and condolences go out to you and your family. Laura – I’m so glad you posted your comment. 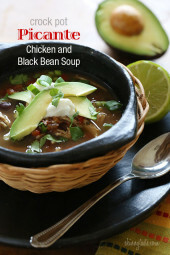 Did you try this as a gluten free recipe and what did you use to make it low FODMAP? Yum! Reminds me of the German pancakes my mom made. We filled them with jam or cinnamon sugar. Today would have been her 80th birthday. So sorry about your father—it is never easy to lose a loved one. I have Czech on my paternal side, so would love more recipes of this sort. Thank you! Thank you Robina, will keep that in mind! My dad would make these occasional and he called them German pancakes. Today I make them for my little grandchildren and they love ❤️ them with maple syrup and whipped cream. I put creamed cottage cheese in mine for protein and top them with sweetned fruit sauce or fresh fruit. These pancakes are my ultimate favourite. Condolences on the loss of your father. My dear departed mother taught me to make these type of crepes and my kids have grown up loving them too. We’ve always called them “English pancakes” as that is what my mother called them. We top them with all sorts of things, but my mother loved syrup and lemon juice the best. I whip up a small batch in the bullet blender when I have a craving. Never tried with lemon but I will have to soon. Thank you! We have a favorite restaurant down here in the Houston area and my favorite dessert is their Banana Foster. It’s a ice cream filled crepe with sauce and bananas on top. I am going to try this recipe at home using this crepe recipe. My Mom is a Brit who would make crepes for us as kids. They were delicious. Years ago in my very first home ec class (yes, this will tell you how long ago that was, lol!) our first recipe to make was Crepes Suzette. I fell in love with cooking and baking that instant. Thank you for the memories your crepe recipe brings to me. It’s my pleasure, I love the idea of banana fosters crepes. I may do that one soon! So sorry to hear of your Dad’s passing. Sending prayers. May his recipes bring many smiles and hugs to your heart! Gina: I’m so sorry to hear about your father’s passing. I lost my dad four years ago, and some of my favorite memories too, are baking for my dad. He appreciated everything I made.. from .jello to homemade pie! My mom passed 4 months before him and along with my siblings, we took care of him for his last couple months. I am so grateful for all the time with him, but also for those last months. We all took turns cooking for him and spending time. I made him his favorite pies; lemon mirangue, cherry, etc… Hold on to all those cherished memories and remind your kids of your father. I know that has helped me. Best to you. I love hearing your story, thank you! I will hang on to the memories forever. So sorry for the loss of your dad. Always remember the wonderful memories he created with you- like these crepes. Can’t wait to try them. Thanks for your recipes each week and for helping all of us in our healthy eating journey. You are in my prayers. My grandmother always made these. She used her big cast iron skillet to cook them in, and filled them with homemade plum butter. So delicious. 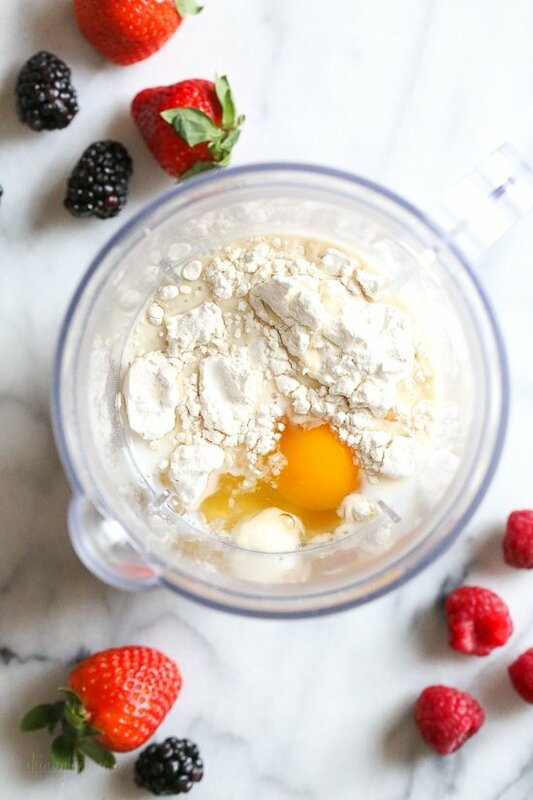 She always just used a whisk to mix them up though – would you find that an acceptable substitution to the blender? Can I hand mix them? I ‘m so sorry for your loss Gina. My family love your recipes and have been using them for at least 3 years. Would love to try them but was wondering if you ever try making crepes using Almon flour? I would like to try this recipe .. what is the best brand and name of the pan you used? The brand isn’t important, just make sure the size I mention is correct and use nonstick. So sorry to hear about your father. Your family is so blessed to continue celebrating his life with these delicious crepes. I just started Weight Watchers and can’t wait to try these with sautéed fresh apple. Your recipes have been life savers for me. Thank you for sharing this family treat. Another Czech (Bohemian) chiming in here. These look delicious & the first time I’ve heard of them, even though I’m 100% Czech on both sides of my family going back forever, & everyone cooked. Do you make any other Czech specialties Gina? I have to admit that while it’s not “skinny”, I adore chicken & Czech bread dumplings in dill sour cream gravy (Vomacka, I believe) – it’s probably my favorite Czech dish. And of course the bread dumplings were considered a “staff of life” for Sunday & holiday dinners. No serious meal was complete without “Sinkers & Grass” (bread dumplings & sauerkraut) – lol! Yes I remember my dad making it with pork or duck. We also grew up with veal stew, saurbraten, Czech burgers, among many other dishes but Dumplings were a Sunday must! Hello i cant believe i came across your post! Seeing your last name i knew someone on your side was Czech and being Slovak myselft it just made me super happy to read these wonderful food comments…. I make palacinky for our girls often and we ate them at home with cheese product called Tvaroh, which I cant buy here…. But I found a great replacement 10% organic vanilla yogurt (Krema) its amazing! You girls are right so many wonderful tasty recipes that could be shared…. Dumplings are one of them, but I find CzechoSlovak food heavy ???? So its more of a treat! I will be following you for sure…. Sorry to hear about your dad ???? Yes the food was heavy, so I agree always a treat. Thanks Marta! so sorry for your loss, Gina. My Dad was from Hungary and these were his favorite too, except we filled them with a creamed cottage cheese mixture. Keep the memories close. Thank you for all your wonderful recipes! My Austrian mother also made palachinka as a family favorite. Would love to see your take on other “local” favorites like goulash, sauerbraten, roladen, etc. Slow cooker when possible. Me too!!! Looks like there are a lot of us Eastern European subscribers! My mom was from Slovakia and Dad from Germany! Would love to see many more recipes from this part of the world! How about Chicken Paprikash? Goulash? Food keeps me connected to my family who has passed as well. Memory Eternal! Me three. I am Croatian and my mom also made palačinke growing up. She usually made them with marmalade but now Nutella is very popular. I would also love some Eastern European recipes. Thank you for all your great recipes and I am sorry for the loss of your dad. I do have a bunch in my book, I will share more. I’m so sorry for your loss. I so appreciate your blog and never comment, but wanted to know I will be thinking of you and your family. So sorry for your lost. And thank you for all those tasty recipes. Looking forward to make the crepes. Are the calories for filled or unfilled crepes? My deepest condolences on the loss of your precious Dad Gina. I’m so sorry. I lost mine in March last year and my mom. 12 years ago March. My mom and my aunt always made “blintzes,” being Jewish, but I had a dear friend from Sweden who gave me almost the exact same recipe as yours. Once I started making them my kids wouldn’t eat my aunts any more! I made a huge platter of them Once for my daughters International festival at school as her dad was of Swedish decent, and the kids not only ate them all but asked for more and wouldn’t eat the other Foods brought. I was embarrassed but secretly pleased that they loved my crepes. My recipe calls for melted butter which makes them very tender, but not much in amount. Thanks for posting this. I don’t make them often for myself, but I just might this morning. I don’t have any milk, so do you think canned coconut milk would sub? Many hugs to you over your loss. ?????? WHat did you put in the blintzes? I might have to try that. Sure any milk should work. Thank you again! I’ll so sorry about the passing of your father. I pray for comfort for you and your family during this difficult time. What a wonderful memorial to you Father! I look forward to trying them! ? Thank you so much for sharing this. I can’t wait to share them with my family. May you find peace and comfort as you are mourning the loss of your dad. I am very sorry for the loss of your father. My father’s parents were also from the Prague area of Czechoslovakia. My mother used to make palachinky on top of the coal stove. There is no way to replicate that flavor and I haven’t had them in decades so thanks for this recipe. She would fill them with Farmer’s cheese (you can still find it around, I think they call it dry cottage cheese) and top them with her homemade huckleberry jam. I too find comfort in these recipes from the old world. Sounds so wonderful on a coal stove, thank you for sharing that.